…the message of Christmas must live on. This probably seems foreign to us — laughable, even — because nowadays it appears that the Christmas celebration ends once December 25 is over, let alone the Twelve Days of Christmas after. As early as the 26th, radio stations stop playing Christmas songs, malls begin their “After-Christmas” sales, and friends start planning their New Year’s parties. Of course, one could say that in America, the Twelve Days of Christmas have been moved to before December 25, as opposed to after. (No one seems to care much for Advent wreaths anymore, after all.) But the stress that we impose upon ourselves on those days — what with shopping sprees, constant cooking, and endless gatherings — often means we don’t get much chance to contemplate the Christmas season. And the premature secular celebrations often mean we fail to celebrate the true reason for Christmas — the mystery of the birth of Christ. Before we go any further, however, I think it’s worthwhile to ask why, exactly, there are the Twelve Days of Christmas. The reason for it is the Epiphany, a feast that celebrates the child Jesus being revealed as Lord and King of the world to the Magi, who followed a star to Bethlehem and offered gifts of gold, frankincense, and myrrh to the newborn boy. (This is probably the scriptural basis for the tradition of gift-giving at Christmas, in addition to the story of St. Nicholas and pagan winter customs like Roman Saturnalia and German Yuletide.) The Epiphany is traditionally celebrated on January 6 (or, in US dioceses, on a Sunday between January 2 and 8). The Twelve Days of Christmas, then, bridge two essential feasts of the Church: the Nativity on December 25, and the Epiphany on January 6. What, then, is the message of Christmas, and why is it so essential for us to live it out? One might say that the message of Christmas is the family, or being home, or giving to others. These are all important and true. But even more so, the message of Christmas is finding Christ — true God and true Man, born miraculously of the Virgin Mary, so that He could die and redeem mankind– and proclaiming Him to world. Follow the example of the Magi. Quite often, we will find Christ where and when we least expect Him. 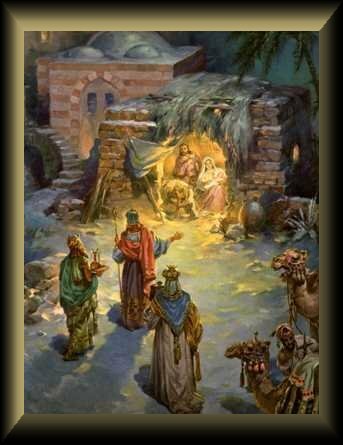 The Magi, after all, found Him in a shoddy, out-of-the-way stable. They found him while pursuing their everyday activities, i.e. stargazing (wise men in the east at that time were expected to be able to interpret the movements of the stars). But when the Magi did find Him, they were ready. They humbly put aside the pretensions of their wealth and rank, offered gifts and adored, and proclaimed Jesus as Son of God and King of the World. That is what Christmas is about. That is the spirit we are meant to renew. And that is why the message of Christmas needs to live on. Find Christ in the unlikeliest of places, and give thanks for that little boy, the son of God, miraculously born to die, so that we might truly live. The Twelfth Night of Christmas is coming, and soon the Christmas season will be over. But continue to live out the message of Christmas in your hearts.